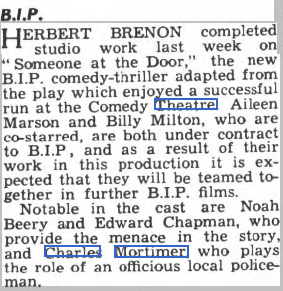 Charles Mortimer played Sergeant Spedding in "Someone at the Door" in 1936. Storyline: A stunt planned by a young journalist to fake a murder comes perilously near to reality when their hiding place is found to be a cache for thieves and real murder is committed. Adaptation of the stage comedy thriller. Ghostly knockings, gloomy underground passages, and creaking secret panels galore in a serio-comic story of a journalist faking a murder and finding himself involved in real dirty work. We have no knowledge of the play from which this film has been adapted, but we can only conclude (in a spirit of kindness) that the pundit minority have no cause to say the cinema level of appreciation is lower than that of the theatre. This film is really an elementary affair, suitable for that type of picture goer who earns the snobbish deprecation of the theatre upholder. 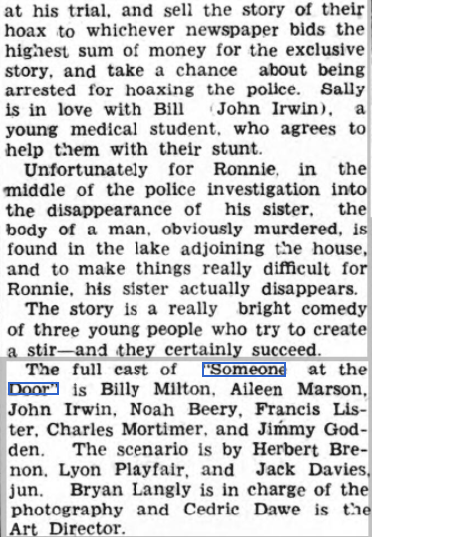 A young free-lance journalist conceives the idea of murdering his sister, disposing of her corpse in their old mansion, and selling his life-story when he is arraigned for trial. His plan goes awry, because their butler is the confederate of a jewel thief, and the local police sergeant is a criminal at heart. Mysterious not yet moved from farcical, take place before the journalist unmasks the policeman as an inveterate murderer! This is the sort of thing which is alternately played in the mood of serious drama and extravagant farce. It is sometimes hard to define which is which, but neither the players nor director can be blamed for this puzzling sensation. As we say, anyone who can take a deep interest in what goes on must be easy to satisfy. Billy Milton bubbles over with joie de vivre as the journalist, whilst Aileen Marson resigns herself comfortably to her fate, Noah Beery plays a ruthless crook on broad lines, Edward Chapman presents a brusque and sullen portrait of a playwright’s butler and Charles Mortimer is the sergeant who participates in crime on an ambitious scale. 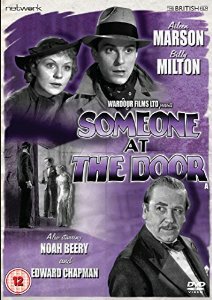 "Someone At The Door.” Wardour. British. 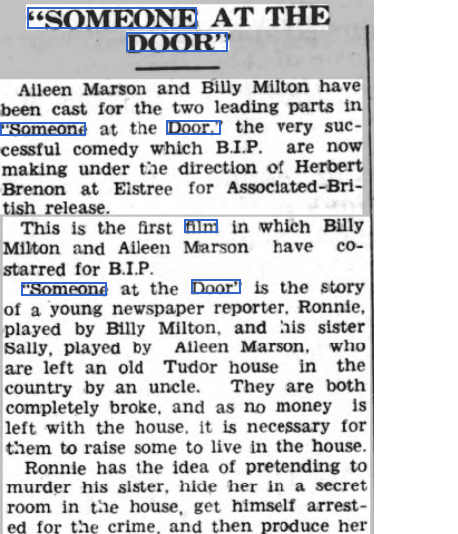 Director, Herbert Brenon. Cast above. 6.737 ft. certificate. General Appeal, Good. F. S. J. 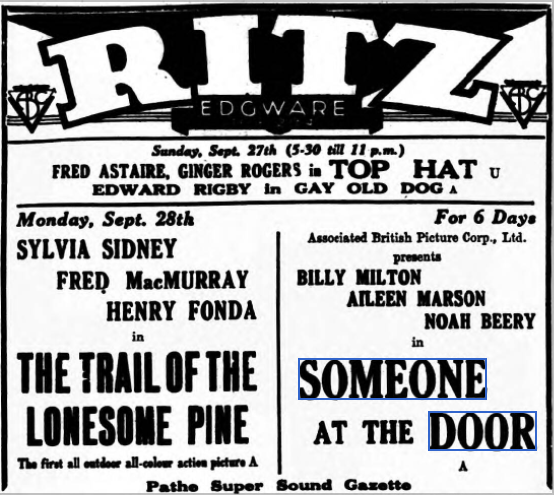 From The Hendon & Finchley Times - Friday 25 September 1936. From The Derry Journal - Monday 11 May 1936.